Olusegun Obasanjo was born on 5 March 1937 to his father Amos Adigun Obaluayesanjo "Obasanjo" Bankole and his mother Ashabi in Abeokuta, Ogun State, Nigeria. His mother died in 1958 and his father died in 1959. He became an orphan at the age of 22. During the dictatorship of Sani Abacha (1993–1998), Obasanjo spoke out against the human rights abuses of the regime, and was imprisoned for alleged participation in an aborted coup based on testimony obtained via torture.He was released only after Abacha's sudden death on 8 June 1998. While in prison, Obasanjo became a born-again Christian. He became chairman of the PDP Board of Trustees, with control over nominations for governmental positions and even policy and strategy. As one Western diplomat said, "He intends to sit in the passenger seat giving advice and ready to grab the wheel if Nigeria goes off course." He voluntary resigned as the chairman board of trustees of the PDP in April, 2012. Afterwards, he withdrew from political activities with PDP. In March 2008, Obasanjo was "supposedly" indicted by a committee of the Nigerian parliament for awarding $2.2bn-worth of energy contracts during his eight-year rule, without due process. The report of this probe was never accepted by the whole Nigerian parliament due to manipulation of the entire process by the leadership of the power probe committee. It is not on any official record that Chief Obasanjo was indicted. 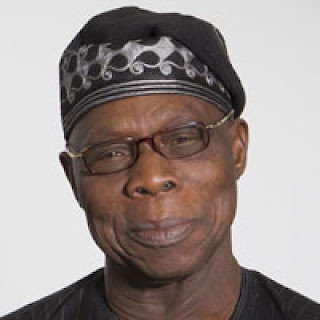 On May 2014, Obasanjo wrote to President Goodluck Jonathan requesting that he should mediate on behalf of the Nigerian government for the release of the Chibok girls held by the Boko Haram militants. On 16 February 2015, he quit the ruling party and directed a PDP ward leader to tear his membership card during a press conference.He was later to be known as the navigator of the newly formed opposition party, the APC. On 24 January 2018, he wrote serving President Muhammadu Buhari highlighting his areas of weakness and advising him not to run for office in 2019. To date all his letters to incumbent presidents have preceded their downfall. On 31 January 2018, his political movement called "Coalition for Nigeria Movement" (CNM) was launched in Abuja. On 10 May 2018, the movement adopts a political party, African Democratic Congress (ADC), to realise its dream of a new Nigeria. Obasanjo was married four times. His wives were Esther Oluremi, Lynda (deceased), Mojiosola Adekunle (deceased), and Stella Abebe (deceased). Obasanjo has twenty children. In alphabetical order they are: Bisoye, Biyi, Bola, Bukola, Busola, Damilola, Dare, Dayo, Deboye, Funke, Funso, Gbenga, Iyabo, Juwon, Kofo, Kunle (nephew Obasanjo adopted as a son), Olumuyiwa, Segun, Seun, and Toyosi. His son, Dare Obasanjo, is a Principal Program Manager for Microsoft. In 1987, his second wife/ex-wife, Lynda, was ordered out of her car by armed men, and was fatally shot for failing to move quickly. On 23 October 2005, the President lost his wife, Stella Obasanjo, First Lady of Nigeria the day after she had an abdominoplasty in Spain. In 2009, the doctor, known only as 'AM', was sentenced to one year in jail for negligence in Spain and ordered to pay restitution to her son of about $176,000. In addition to a variety of other chieftaincy titles, Obasanjo holds the titles of the Balogun of Owu and the Ekerin Balogun of the Egba clan of Yorubaland. In December 2017, Obasanjo defended his Ph.D thesis at the National Open University of Nigeria (NOUN). He now holds a Ph.D in Theology. That was about two years after he completed his master's degree in the same course.